The enticing smell of barbecue is something that’s hard to ignore. Watching pieces of pork, chicken meat, or giblets being skewered on sticks and cooked over a charcoal grill will definitely leave your mouth watering for a bite. There are many small-town pubs and restaurants in the city that offer a wide variety of these grilled goodies to their customers. Designing a menu that relays the details of these offers must be done strategically to help make an impression that sells. As a start-up, you probably have a lot to get done with only a little knowledge of what to do, if at all. There’s a lot of pressure that comes with getting started. 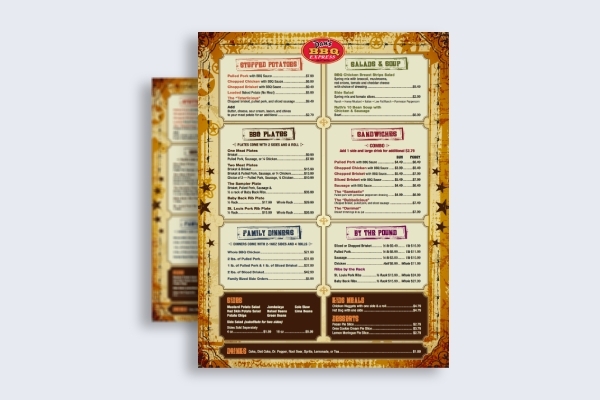 One of the essentials that every business in the food industry must come up with is a menu design. Using a template for this matter will make it easy for you to produce a menu which can generate a profitable outcome with diners. 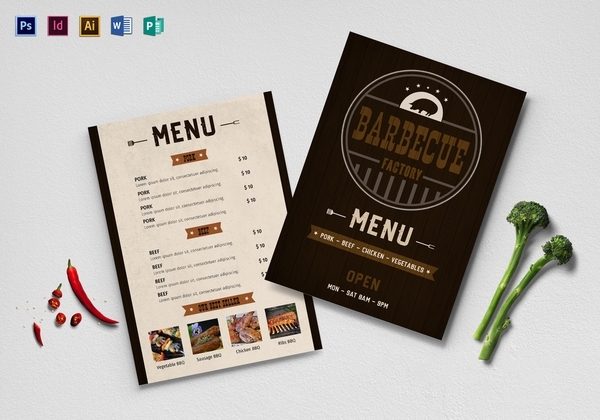 So if you need a template to make your barbecue menu, this template would be the perfect choice to suit your business needs. Simply personalize the template by incorporating the elements that best reflect the nature and objectives of your restaurant. By doing so, you can leave a lasting impression that customers are sure to remember. Many companies in the restaurant business offer catering services to clients who require food service at a remote site, such as a hotel, cruise ship, studio, filming site, or event venue. 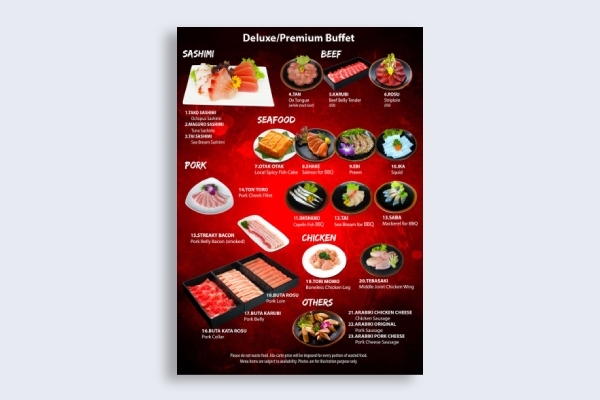 A catering menu is usually provided for prospects to see whether their necessities may be met or not. 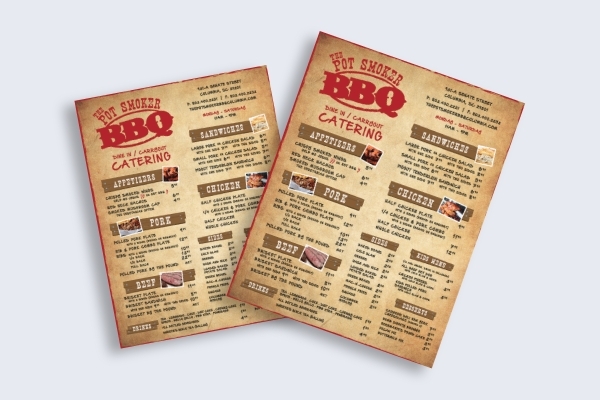 BBQ menus, in particular, contain a vast range of pork, meat, and chicken cuts that may be prepared and served by the hired staff at a client’s request. These menus are typically presented to clients beforehand so the necessary arrangements can be made prior to the event. This includes the ingredients and pre-made goods that need to be prepared to ensure that every guest present at the venue is accommodated. Some customers are lucky enough to have a sit-down dinner with their companions as they devour every bite of their favorite meals. On the other hand, there are those who don’t even have the luxury of time to relax and enjoy every piece. This is one of the reasons why more and more restaurants are beginning to offer fast-food, takeaway, or delivery options to customers who are always on the go. Express menus are pretty common, even among BBQ restaurants. Their takeout menu is likely comprised of food and beverage items that are easy to pack and carry around. Given how customers of these establishments are often in a rush, it’s important to section items in the menu according to their designated categories. This will help hasten the ordering process for a quicker, more convenient customer experience. Although most of us are guilty of ordering the same dishes whenever we’re at our favorite restaurant, it’s still a good idea to supply your customers with a wider variety of options to choose from. Upselling some of the more profitable items in your menu is one way to help your business increase its sales value. You can do so by using high-quality images and applying them sparingly to your layout. This should capture a diner’s attention and encourage them to order more than what they intended to. This can also be done to increase the chances of repeat customers coming in to try out more of what you have to offer. The thing about charcoal-grilled food is that you can never have enough of it. While five sticks of pork barbecue might sound good, you’re bound to crave for more as the scent of a few burger patties being grilled starts filling your system. 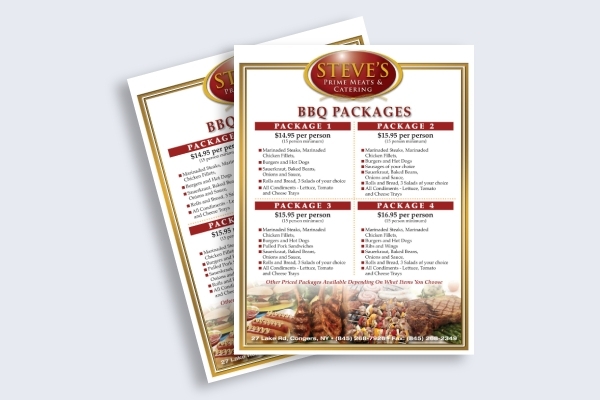 Thus, many BBQ restaurants offer food packages to accommodate large groups and catered events. The price of each package would depend on the number of people it caters to as well as the type of food items available. Huge discounts are even provided to customers who avail themselves of these services, as these do lead to better sales for the business to thrive in a competitive market. To make a food menu for such, make sure to make each package as satisfying as the other. This must be done strategically enough for customers to splurge on what they believe is the most fulfilling. Who doesn’t love some Japanese cuisine every now and then? You can find several restaurants around the world that serve authentic Japanese yakiniku (grilled barbecue) for customers who are looking for a unique dining experience that’s unlike anything they’ve ever tried before. Here, diners are given the opportunity to cook their own meals over a flaming charcoal grill as they enjoy a cold bottle of beer from the restaurant. Food items in these restaurants are sometimes served through a buffet menu for customers to choose what they want from the wide range of meat options. But keep in mind that not everyone is familiar with foreign cuisines, so it’s best to include photos of each dish as a visual representation of anything labeled in Japanese. This should be done without sacrificing the overall appearance of your layout, so as to maintain the readability of the menu’s content. We often go to a restaurant to feed our hunger and satisfy our cravings. What we find in a restaurant menu can greatly influence our initial perception toward the establishment along with our decision to stay or search for something better elsewhere. For this reason, it’s important to design a menu that’s even worth a second glance. 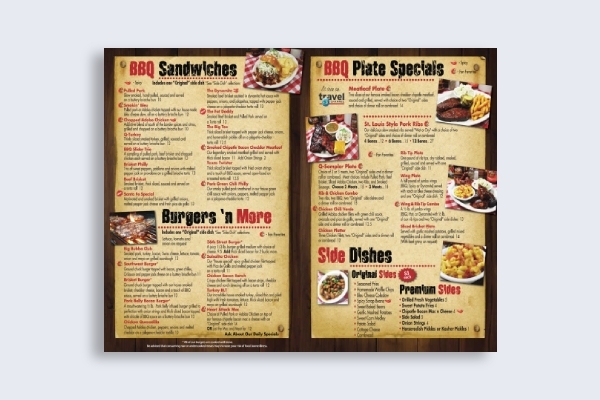 Shown above is a good example of a BBQ menu that’s charming enough to drive foot traffic to your restaurant. 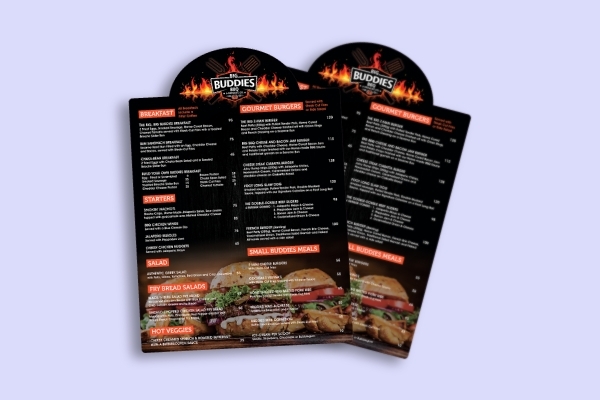 You can use the menu card to entice passersby and initiate a conversation between you and a potential customer.